I remember a poem, I think it was by Bertolt Brecht, although I wasn’t able to find it again that ended with the sentence “und manchmal trifft man auch auf Menschen” and sometimes we also or still encounter people. What makes “people” be so worth mentioning that apart from our day-to-day interactions we choose to register their presence as especially humane? There are people you meet once and their memory remains in your mind, having its own texture and depth, the memory of their character remains embeded in your mind, like a stone and yet, at the same time a vulnerable presence. I for one, even remember their hurt or their agitation, or their rare moments of doubt or timidity. When I meet them, even if the memory fades when confronted with the actual presence and spend a few hours with such a person, or with them and their spouses (come to think of it all these people I know are happilly married- althoug not always in their first marriage- and at least in most cases somewhat older than I am, at least in their thirties), I feel an urge to cry. But please don’t imagine pathetic lamenting tears (which one should try to keep away from) it’s more like my soul getting a clean up and needing to evacuate the dirt. I try to keep close to such people and not dissapoint them all too much. Due to my lack of self-confidence I might do small errors that are open to their judgement, but I think the only way to lose such a person is betrayal. It’s a very tough word that except in cheap movies is not really being used today. And it’s too bad it’s not: we are saying good-bye to calling humane things what they are and this makes it harder to accept their consequences in our lives. It also makes it harder to build our character accordingly since we do not know what to avoid. What I have learned to understand is that betrayal is never done by one person to another person this is just the visilble component of the process and the one that hurts the other. In fact the first act of betrayal is against yourself, when you decide to betray what you hold to be true for that what you think you should hold to be true. After that betraying those who you were fortunate enough to be able to love (because the ability to love, as we have learned for Erich Fromm, is not a given fact) is only a matter of time. Since your own subjective, yet very serious perception of truth and therefore of love and everything that derives from it, is no longer your referance point for your actions. You do not betray a person, you betray the truth and if the person stays with the truth you betray the person as well. Regardeless of your history, since your history is no longer of relevance in your disballance. This is all a very painful and confusing process that should be avoided. 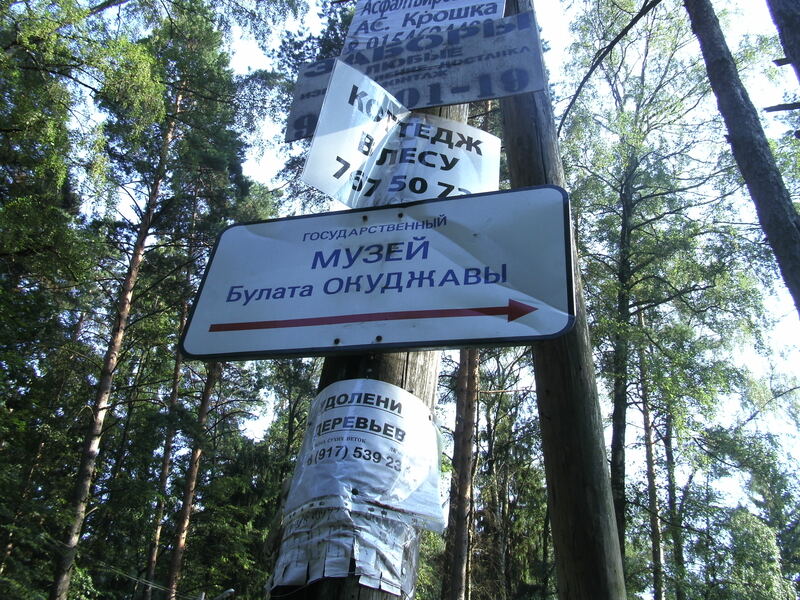 On my third day in Moscow I went to Peredelkino, a writers’ village about 20 km away from the Kreml built in the thirties on the initiative of Maxim Gorki. I went there because I always wanted to see what a writers’ village looks like: wouldn’t you? My guidebook said it is a “weit-laufiges Dorf”, meaning you have to walk a lot to find the houses. I already expected it not to be a village at all and after spending a day there, I still think it’s not really one. The whole village is made up of small houses, called datchas ( datcha seems to be the Russian word for home). The distances between them would allow to go for long periods of time without seeing your neighbours, but if you would go for a walk or intend a visit this was always possible. Today, additionally to the new houses one finds the houses of the newly rich, as well as not very tall apartment buildings. The train station is quite far away and if you ask passer-byes for Peredelkino they will send you to Novo Peredelkino, where you can find country town life of little literary interest. So, if you want to get there you have to be more specific: I asked for Boris Pastarnak’s house. Everybody knew where it was. It also gives a good picture of what the houses must have looked like in the times of the Soviet Union. Nazim Hikmet who seems to have been on my mind the first days of my stay in Moscow, also chose to spend the first years of his exile in the Soviet Union here (as far as my modest internet research could unearth). 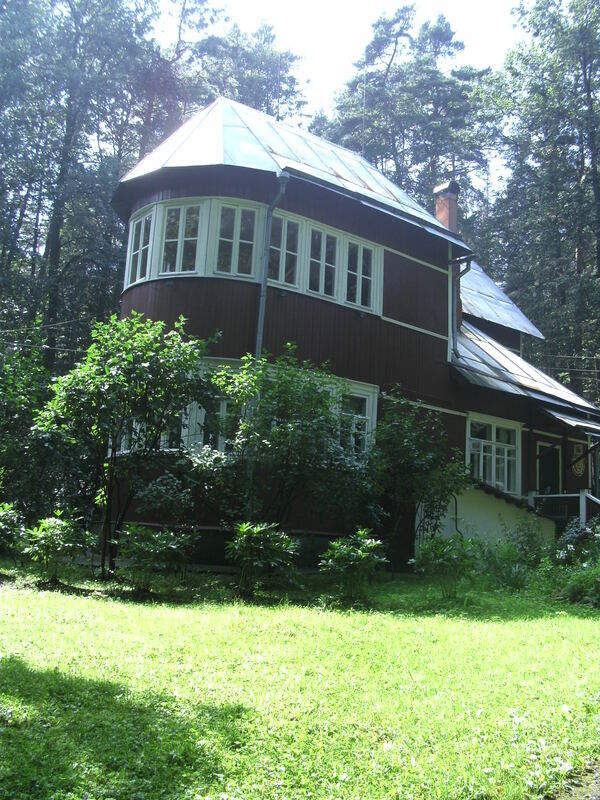 After visiting Pasternak’s house walking around Peredilkino I realized I need a destination for my excursion not end up being just a walk in the forest. So I followed a series of signs. I had never heard neither a song nor a poem by Bulat Okutschawa and I did not know who he was. My intuition and the positive connotation of the word “museum” in my mind made me follow these signs for more than half an hour to find out where they’ll lead me. You could hear guitar music from far away and when I entered the garden all the signs pointed to, I encoutered two women talking and obviously avoiding to sit and listen to the concert. They asked me if I’m here for the museum and I said yes. By the time we got to the third question it is obvious that I didn’t know what museum I was there for and they asked me what I am doing here if I never read Bulat Okutschawa. I told them I just followed the signs. Dissapointment. And of course my own discomfort: what was I doing there? i mean I couldh’ve returned to Moscow spent one more afternoon at the Tretyakow Gallery instead of spending my little time looking for museums in the forest. Yet, I was already there and there was no possibility to vanish in shame and confusion. So, I decided to spend my time there and enjoy it. They went on about the concert: I noticed the woman speaking to me had that unique form of character that is decisive and friendly but very truthful at the same time, blond dyed hair and the strong built of older Russian women, yet with the delicacy of a very feminine nature. Her friend invited me to sit down for the concert, as they had an artist as a guest for the afternoon. The woman with the blond dyed hair said, this wasn’t an artist. And in a low voice, rather a prostitute. (It might be my lack of Russian, but the word seemed quite clear and is the same in Russian, as in any other language). I sat down and noticed what my discussion partner meant. It was indeed not really a hearty folk singer, more like an agitated band wanting some attention (two men were also involved playing the guitar). After half an hour at the concert I had had enough and decided to return to the two women still standing. They asked me if I wanted to see the museum, i said yes, of course. They asked me about Romania and told me Bulat’s poems had been translated in Soviet times. They had been very happy about it. The stress on Soviet was definetely positive and I wondered how many people in the Romanian art scene have a good memory of the socialist time, since probably their voices wouldn’t be heard in our cultural industry today. A student, who spoke good English, was called and she showed me around the house. We entered a datcha that had three rooms, two of them were open to the public as a museum and the other one looked like a Romanian living room in the country side: a dusty old carpet and a huge old TV set, an old wooden table wirh old wooden chairs, a big old sofa, resembling a dusty divan and everything covered in unidentifiable, apparently unneccessary stuff. We went to Bulat’s working room. The first thing one notices is a collection of small bells hanging from the ceiling. A friend once brought him one and as he kept telling everyone what a wonderful gift this was, he kept receiving them. At one point he hung them from the ceiling in front of the window, so when the wind would pass through the room it would ring all the bells, calling his friends to him. On the wall there were pictures of his most beloved faces: including his wife. And now I realized and was told that the blond woman, who had received me was his widow. As he had used his guitar to accompany his poems, they would organize concerts every saturday in his memory. I looked at the portrait of his wife when she was young and smiled: her face was shining with the feeling of triumph, triumph was embeded in her traits, in her being. She was beautiful with the beauty only a woman, who loves and has the certainty that she is loved back can have. There is no doubt, no insecurity, no hidden thought. Just triumph. Some confuse it with arrogance and others envy it or cheaply try to imitate it, the make up industry makes money out of it. But very few know how it exists and the faithfulness it takes to live it. (here the German word Treue would be more appropriate). So, if you are ever in Perdelkino, bring a bell to the museum house of Bulat Okutschawa. They’ll hang it and it will ring when they open the windows.